There’s an air of familiarity that is laid on thickly at the start of Tim Burton’s Frankenweenie. From the ominous sharpness of its suburban community to the picture’s many tired faces, Frankenweenie’s déjà-vu qualities extend beyond being an adaptation of Tim Burton’s short film. But as the picture begins to settle and ground its central dog/boy companionship narrative, Frankenweenie becomes less a picture drawing upon Burton’s rich (though somewhat exhausted) aesthetic appeal and more about a boy’s endeavor to hold onto his best friend. As extensively stylized as any of Burton’s films, what makes Frankenweenie so appealing is that once the aesthetic is stripped away, what is left is a sweet (though somewhat shallow) narrative on the bonds of friendship. Paying homage to monster movies of old, Frankenweenie rarely instills a greater sense of appreciation for films like The Birds, Godzilla, or Frankenstein other than particular visual cues. Its peculiar nature is most indebted to Burton’s own pastiche, particularly Edward Scissorhands and Beetle Juice. But what Frankenweenie most uniquely addresses among what I’ve seen from Burton’s oeuvre is the sense of anxiety that comes with youth. The most resounding thematic element in Frankenweenie deals with Victor’s (Charlie Tahan) sense of loneliness. But unlike ParaNorman, which addresses a similar sense of isolation from youth, Victor’s social standing amongst his classmates is never really made apparent. Perhaps a result of the overt bizarreness of the picture, so many of its characters stand on the outside looking in. What’s most disconcerting about Frankenweenie is its aimlessness. Many ideas are tossed throughout the picture, from a science teacher acknowledging the stupidity of the townspeople to a group of classmates attempting to recreate Victor’s reanimation process. But none of these ideas gel with the picture’s central narrative of a boy’s loyalty to his pet. There’s simply not a whole lot of bite to its material. Despite its gorgeous visual palette, the picture is simply content with being sweet. While this may be an unfair comparison, Frankenweenie is simply obsolete when compared to the recent ParaNorman. The similarities between the two may not go much further than having a deep-rooted appreciation for horror films and dealing with the troubles of social acceptance in school, but everything about ParaNorman registers as a more mature and tight effort. The ideas in ParaNorman all coalesce into a meaningful climax. 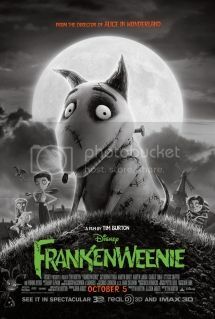 With Frankenweenie, so much of the picture’s fleeting themes and ideas, from a potential romance to its scientific queries, converge into a messy chase sequence that, while humorous, doesn’t have much thematic heft.